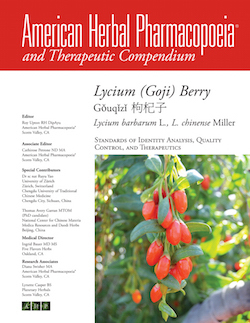 The American Herbal Pharmacopoeia® (AHP), a California-based nonprofit research organization, is pleased to announce the release of a Monograph and Therapeutic Compendium for Lycium (Goji) Berry (Lycium barbarum L., L. chinense Miller). The monograph was a joint effort of AHP and researchers at University of Zurich and University of Basel, Switzerland; Chengdu University of Traditional Medicine, Hubei University of Chinese Medicine, and National Center for Chinese Materia Medica Resources and Daodi Herbs, China; the Chinese University of Hong Kong; Poznan University, Poland; and University of Florence, Italy and was reviewed by a multidisciplinary cadre of experts representing traditional herbal medicine, botany, chemistry, pharmacognosy, pharmacology, and lycium cultivation. Known in Mandarin Chinese as gouqizi (枸杞子), lycium (goji) berries are among the most common berries used as general and medicinal foods, as well as in formal medicinal prescriptions, in the practice of traditional Chinese medicine (TCM). With recorded use as early as 259 BC, consumption of lycium (goji) as both food and medicine has persisted into modern times much in the same way as consumed historically. More recently, its acclaim as an antioxidant-rich tonifier has led to the increased popularity of the juice. Until a few short years ago, goji was almost exclusively only known by the Chinese community and the relatively few American Chinese medicine herbalists in North America. The popularization of the juice through multi-level marketing has led to widespread popularity and notoriety as a super food and it is now found in mass market grocery stores, juice bars, and the natural foods sector. In addition to its centuries of traditional use as both a medicine and a food., numerous small-scale clinical trials and even a meta-analysis have been performed. That is amazing growth in such a short time and shows the potential of botanicals both in terms of health care and economics. The AHP Lycium (Goji) Berry Monograph and Therapeutic Compendium (PDF) can be purchased by clicking here. For those wishing to buy copies in bulk for dissemination to customers or health practitioners, please contact us directly.